There’s so much to like about this story. I wish that it could be repeated in so many more places. A Chapman University senior became the first transgender contestant in the university’s annual all-woman pageant Wednesday night, winning the title of Miss Congeniality. Addie Vincent, 21, faced off against 15 other competitors for the title of Miss Delta Queen, a competition organized by the university’s Greek system. The pageant’s winner was Alexandria Kessinger. Throughout the contest, many of the 500 students and audience members whooped and hollered every time Vincent took the stage at Memorial Hall. Following the poem, students shouted, “We love you Addie!” and gave Vincent the night’s only standing ovation. Each contestant was nominated by a campus fraternity or sorority. The Alpha Delta Phi fraternity chose Vincent with a 20-0 vote, with fraternity members saying they nominated the senior to show support for the transgender community. I’m a little troubled by the fact that she had to be nominated by her fraternity, but that may just be a necessary incongruence. 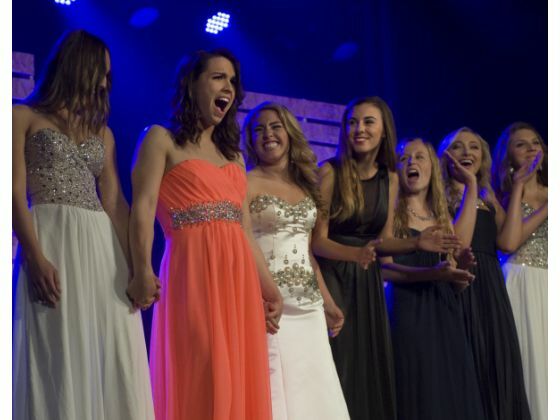 Transgender student inspires at Chapman pageant – The Orange County Register. This entry was posted in Education, Entertainment, Fashion, Testamonial, Youth and tagged beauty contest, california, college on March 14, 2014 by .